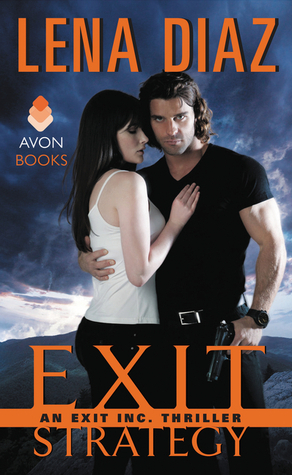 Released on June 30th, by Avon, Exit Strategy by Lena Diaz is the first book in her Exit Inc. series. This book is romantic suspense from page one through to the end. I'm happy to be hosting a stop on this book's blog tour! Exit Strategy is available now! Exit Strategy was a generally entertaining read for me. There were a few bumps along the way, but overall, the plot was strong enough to keep me on board through to the end. So what I loved about Exit Strategy is the way it placed me right in the middle of all the action. It quickly becomes clear that there's some juicy backstory that could easily have been the first book in the series (is there a novella out there? Or maybe the tail end of a previous series? I don't know!). It creates this really rich background for Mason and Sabrina's story, one that I fully appreciated. I was entirely into Sabrina's hunt for her grandfather, Mason's dilemma over whether or not EXIT is targeting innocents other than Sabrina, and the unveiling of the plot arc. This is a world of violence, grudges, action, and vengeance, and I was completely into it. I love spies, assassins, master thieves and the like, so this aspect of the story was right up my alley. There were two elements that I didn't enjoy quite so much. One was the romance. I found Mason's early reactions to Sabrina to be a little dopey. He's completely bowled over by attraction for her, and it was too over-the-top for me. Some scenes did draw me into the relationship, and had me cheering for them, but most of the time, I just wasn't interested in that part of the story. The other issue I had was with the pacing through one of the viewpoints in the book. The CEO of Exit figures into the story, and his viewpoint sections were s-l-o-w for me. I understood that they probably(?) were vital for conveying the entire story, but I found myself skimming big sections of them because much of it was monologuing his side of things or receiving intel and then contemplating the state of affairs. I don't know what the book would have looked like if his sections were axed or cut down, and the story was changed to focus more on Mason and Sabrina figuring things out, but I did wonder a time or two what that would look like. Still, the action is top notch. Exit Strategy is also very good at 'increasing the stakes.' Sometimes it's a little blatant, but it was still effective. That sense of imminent danger was present through the entire book and that helped propel the story, whisking me through the slow sections because I *wanted* to know what would happen after them. Exit Strategy develops a contemporary world of intrigue, action, and violence. At the heart of its premise is a very timely ethical dilemma--is striking first justified? The romance was a bit enh for me, particularly at the start, but overall, the action and the unraveling of the plot kept me engaged through to the end. For fans of romantic suspense, mercenaries/government agents, heroines who can take care of themselves.